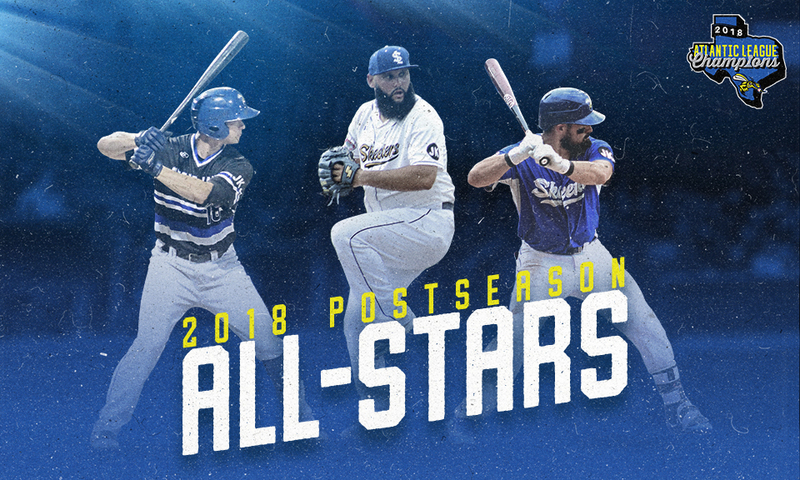 SUGAR LAND, TX— Sugar Land Skeeters first baseman Matt Chavez, outfielder Anthony Giansanti and right-hander Felipe Paulino were named Tuesday as Atlantic League of Professional Baseball Post-Season All-Stars. It marked the first ALPB Post-Season All-Star selection for all three players. Chavez and Paulino were two of the six Skeeters who were selected to the 2018 Atlantic League All-Star Game in July. Chavez, 29, led the Skeeters with a .320 qualifying average and 151 hits, and was tied for the team lead with 72 RBIs. Chavez’s .320 average was the highest single-season qualifying batting average in team history. He ended the season seventh in the league in hitting and was second in hits, as his 151 hits also served as a professional career high. Chavez was tied for third on the Skeeters with 22 doubles and 12 home runs, and was third with a .371 on-base percentage. Giansanti, 30, finished the 2018 campaign with a career-high 17 home runs and 35 stolen bases, becoming the first player in Skeeters history to hit at least 15 home runs and steal at least 30 bases in a single season. Giansanti, who appeared at all three outfield positions, along with second base and third base, ended the season with a slash line of .295/.357/.456. His 35 stolen bases placed him at fifth in the league and his 17 homers put him at No. 7 in the league. Giansanti also scored 79 runs, which were the second-most on the Skeeters and fifth-most in the league. Paulino, 35, led the Atlantic League with 33 saves, which also set a Skeeters single-season record, surpassing Derrick Loop’s 32 saves in 2016. The former Major Leaguer ended the season with a 1.18 ERA, which was the lowest of any pitcher in the league with at least 50 innings pitched. Paulino appeared in 54 games in 2018, leading the Skeeters and placing him at No. 4 in the league. He also finished the season with 72 strikeouts over 53 ⅓ innings pitched. The Skeeters won their second Atlantic League title in franchise history in 2018, beating the Long Island Ducks in five games in the best-of-five Atlantic League Championship Series. The team had 12 contracts purchased by Major League Baseball Organizations and 14 total contracts purchased by outside professional baseball organizations, which were both Skeeters single-season records. Since the Skeeters joined the Atlantic League in 2012, the Ducks are the only other team to win at least two league titles.